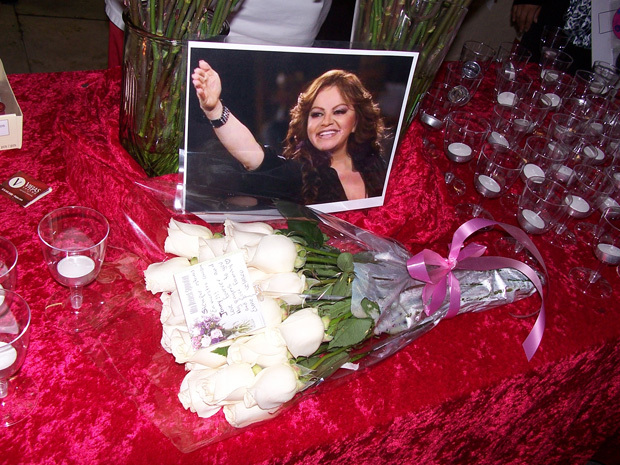 A memorial table for Jenni Rivera after her plane crashed in Mexico in December 2012. Photo by Matt Cohn. After approving a motion to name a park in honor of Mexican-American music icon Jenni Rivera in December 2014, Mayor Robert Garcia, Sixth District Councilman Dee Andrews and members of the Department of Parks, Recreation and Marine will formally open Jenni Rivera Memorial Park July 2. It’s been nearly two and a half years since the 43-year-old Rivera’s plane plunged into a hillside in Iturbide, Mexico killing all those on board. The news of her death made international headlines and set off vigils on both sides of the border. In addition to being a Grammy Award-nominated artist and recognized as the highest-earning Banda singer of all time, she was a lifelong resident of Long Beach, attending Long Beach Polytechnic High School and a philanthropist. In the wake of her death, Sixth District Councilman Dee Andrews called for the city to name a park in his district in honor of La Diva de la Playa Larga in October 2014. The motion passed unanimously in December of that year. The currently unnamed park located near Chittick Field will include a 125-foot mural dedicated to Rivera’s life that will be unveiled at the grand opening of the park. The mural was funded by Jenni Rivera Enterprises and painted by Sergio Ramirez and Daniel Antelo of Wall Dogs—famous for their works on skyscrapers in Los Angeles—and her son, Michael Rivera. In a statement, Mayor Garcia said that by dedicating the park to Rivera, it honors one of the Long Beach greats. The honor is not the first to be given posthumously to Rivera, as the Grammy Museum decided to display many of her personal belongings in an exhibit that opened in May 2013. The Rivera family said they were thankful for the city’s naming of the park in memory of the singer, as she always saw herself as part of the city, no matter how bright her star shined during her career. The grand opening of Jenni Rivera Memorial Park will take place on Thursday, July 2, at 10:00 am. The park is located at 2001 Walnut Ave.